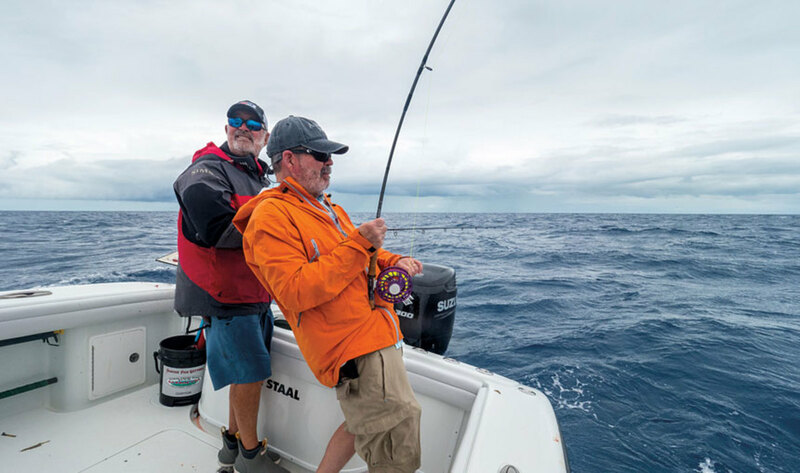 Bill Sisson (right) bends a rod off the Florida Keys, with guide R.T. Trosset. I entered the industry through a side door — with a fishing pole in hand. For me, fishing came first. My pursuit of scales and tails led me to boats. And my love of writing pointed me toward a career in journalism. I became editor-in-chief of Soundings magazine about 20 years ago. And a decade later, when Trade Only was in need of a chief editor, I took on that role, as well, with a little persuasion from longtime Trade Only publisher and friend Dean Waite (who recently retired). “You’ll learn a lot more about boating by coming over to the B2B side,” Dean told me. He was right. The date was noteworthy: September 2008, when the world’s economy tumbled over a cliff. In hindsight, there was no better time to take the helm of a business magazine than in the face of a Force 10 storm. Reporting on those dark days and the subsequent rebound provided me with an education I couldn’t have obtained any other way. Together, you readers and I learned first-hand the challenges and lessons of running a business under extreme conditions, especially in an industry that relies so heavily on discretionary income. That experience has given many of us the perspective to appreciate just how far back up this resilient industry has climbed. And it has made me a better consumer magazine editor, as well. That was almost 10 years ago. We’ve left some history in our wakes since then. The industry is in the midst of a record seventh consecutive year of growth. The unemployment rate is at historic lows. The wealth effect created by the second-longest bull market in history — few in the industry thought we’d be saying that today — continues to drive sales. Inventory levels are healthy. These are sure signs that the time is right for change. I’m excited to turn over the reins of Trade Only to respected marine journalist Michael Verdon. The nice thing is, I couldn’t feel more confident about the future of the brand. Michael is a smart, experienced editor who has a deep understanding of the boating industry. He and new publisher Michele Goldsmith will make a strong team. It’s great to have them on board. I’ll miss the day-to-day of Trade, but I’ll still be involved in helping shape the direction of this venerable franchise. In this business, you take off one hat and quickly replace it with another. I was recently promoted to vice president and editorial director of the AIM Marine Group, which publishes seven magazines: Power & Motoryacht, PassageMaker, Soundings, Yachts International, Anglers Journal, Sail and Trade Only. In that role, I’ll work with Michael and his team as Trade Only moves forward, opening another new chapter as the industry’s digital and print information leader. Stay tuned. The change also will allow me to focus more time and energy on Anglers Journal, the five-year-old, award-winning quarterly, where I serve as editor-in-chief. Fishing has captivated me since I was a boy, sitting on a dock beside my father and older brother, catching cunners on a hand line with baited hook and sinker. Waiting for the tap, tap, tap, I gazed in wonder at the world that stretched from below my feet to the bay and ocean waters beyond: the pull of the tide, the smell of bait and fish on your hands, the cry of wheeling gulls, a hand on your shoulder, a flapping fish. Nice how it all comes around.